Macroeconomic stability and expansion in Europe have allowed Serbia to grow even throughout its fiscal consolidation, with growth of 3.5% forecast for 2019. Participants in the Kopaonik Business Forum warned that this rate of growth would outstrip the country’s potentials, and that maintaining high foreign direct investment must be accompanied by increasing the extent and efficiency of public investment and improvements to the business environment, key for boosting domestic private investments. Growth would best be promoted by consistently practising the tenets of market economy, building institutions, and enhancing the rule of law. In November, the Pristina authorities imposed 100% tariffs for Serbian goods, and in December extended the range of products affected. Ongoing efforts to remove this obstacle have included visits to the region by US Under Secretary of State David Hale, a delegation of the US National Security Council, and key advisors to German Chancellor Angela Merkel. Businesses unanimously agree the tariffs must go. The issue of Kosovo and Metohija is the key internal risk to the economy, as any additional tensions would adversely affect economic activity, investment, and growth throughout the region. No review of the month would be complete without a look at the pressing political issue: on the one hand, the ‘Future of Serbia’ (#Budućnost Srbije) campaign pursued by Serbian President Aleksandar Vučić, and, on the other, the protests that have been taking place in several cities under the slogan ‘One of Five Million’ (#1od5miliona). Apart from topics such as Kosovo, the President has focused on economic stability and growth. Demonstrators and opposition parties claim there is no rule of law in Serbia and are critical of the situation in the media. These events have revealed a nation looking for robust political dialogue and broad consensus around fundamental values that could underpin both government and society. This year’s International Women’s Day was marked by efforts to end abuse, which found their figurehead in Marija Lukić from the town of Brus, who raised her voice against sexual harassment by her employer, the local mayor. Initially she stood alone, but her personal bravery attracted powerful support from large segments of society, which have now been asking for Marija to be given protection in a fair trial and shielded against retribution because of her willingness to stand up to her abuser. Thousands of women throughout Serbia have been the targets of abuse, but have been keeping silent for fear. The case of Marija Lukić has served as a reminder that they are not alone and that they should not tolerate violence or mistreatment. 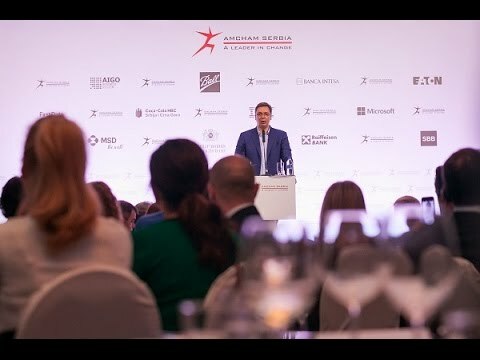 AmCham’s General Assembly Meeting has once again proven that this association of 206 private businesses from 18 sectors is a recognisable and strong voice of private enterprise in Serbia. Over the past year, AmCham has attracted a record number of members, held more than 100 successful events, and engaged more than 2,000 businesspeople, civil servants, researchers, journalists, and other associates. As a symbol of its commitment to improving business practices in Serbia, and aiming to acknowledge the individual, organisation, or institution that represents the role model of excellence in Serbian society, AmCham awarded this year’s Leader in Change HERO Award to renowned Serbian scientist, the geneticist Professor Dr Miodrag Stojković.